West Gambier’s Lisa McGregor looks for options inside the shooting circle as the Roos bounded to a win over Millicent in Round 14 of Western Border netball. 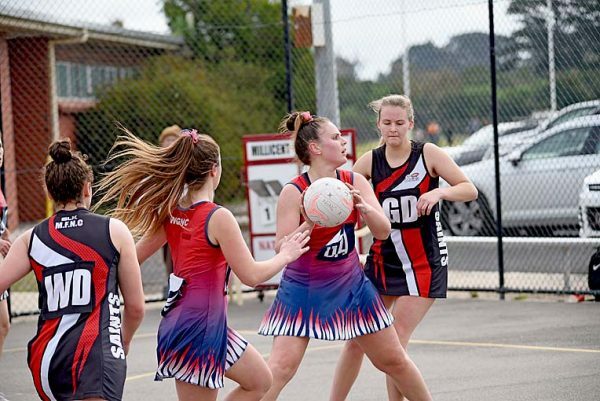 SINCE 2008, just one club has managed to find a way to defeat Millicent in the Western Border Netball Association A Grade competition and on Saturday the Roos did it again, West Gambier securing an 11-goal victory in the upset of the season. It was built on some slick work at the offensive end and some tight checking defending and on the accurate finishing of both Lisa McGregor and Tahlia Earl, who arguably had her best shooting game in history.